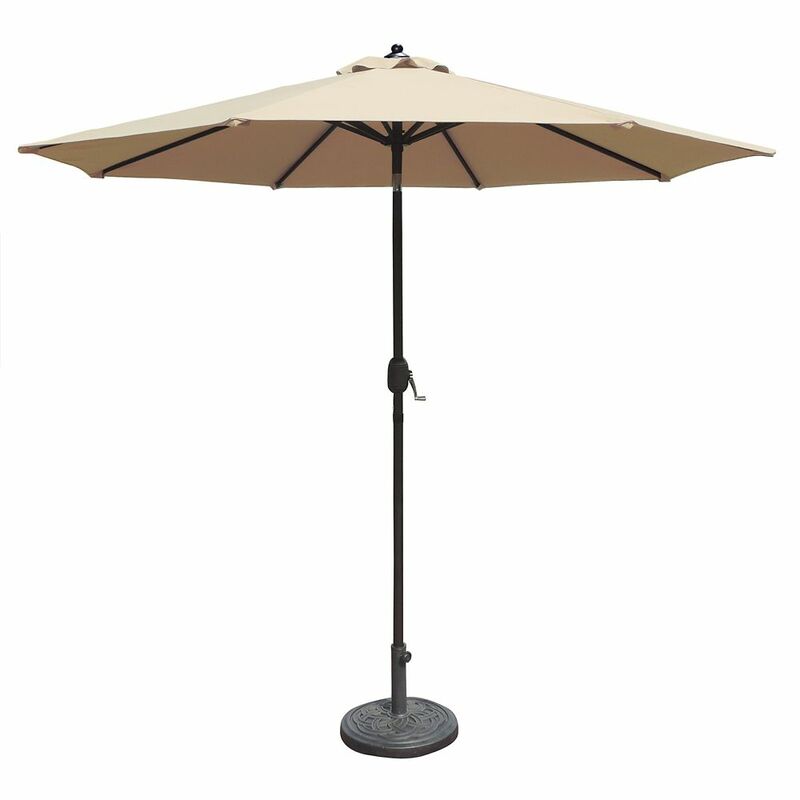 The Mirage 9-ft Octagonal Market Umbrella makes the perfect addition to any backyard. The durable 1.5-in diameter rust-resistant, anodized-aluminum pole is finished in a rich powder-coated bronze color. It has an easy-to-use crank to open and close the canopy offering convenient adjustable tilt positions with a simple turn of the crank to obtain your desired shade. The sturdy aluminum 8-rib canopy support system, covered in fade and weather-resistant olefin fabric, sports a single wind vent that allows air to escape freely to limit wind damage. The Mirage provides up to 57 square feet of shade area with ease of operation, all at an affordable price. Olefin fabric canopy backed by 2 year warranty; 3 year warranty on pole and structure. 50-lb base recommended (sold separately). Sharing special moments in your own backyard is easy with the PZT-724-U Patio Umbrella from CorLiving. Made with a durable wooden frame and a UV resistant umbrella fabric, this product is ready to withstand the elements of the outdoors. This unique design with solar powered LED lights will light up your patio every evening, so you can continue to relax outdoors into the warm summer nights. From your patio to the beach, this umbrella keeps you cool and protects you from the sun with its UV resistant fabric. This beach umbrella doubles as a patio umbrella for added versatility. The vented canopy and wind tension setting provides added stability during windy. Included is a carry bag that makes it easy to move and store. This 11 ft. Offset LED Patio Umbrella is generously sized to block the sun's rays all day long. The solar cell on the top of the umbrella charges throughout the day to allow the LED lights to add a gentle ambiance to your evening gathering. It features easy tilt operation which is more user-friendly than ever. Simply update and add a splash of colour to your outdoor living space with this decorative umbrella. Designed to provide shade against the sun. Made of durable outdoor fabric for easy care and enduring beauty. Mirage 9 ft. Octagonal Market Umbrella with Auto-Tilt in Champagne Olefin The Mirage 9-ft Octagonal Market Umbrella makes the perfect addition to any backyard. The durable 1.5-in diameter rust-resistant, anodized-aluminum pole is finished in a rich powder-coated bronze color. It has an easy-to-use crank to open and close the canopy offering convenient adjustable tilt positions with a simple turn of the crank to obtain your desired shade. The sturdy aluminum 8-rib canopy support system, covered in fade and weather-resistant olefin fabric, sports a single wind vent that allows air to escape freely to limit wind damage. The Mirage provides up to 57 square feet of shade area with ease of operation, all at an affordable price. Olefin fabric canopy backed by 2 year warranty; 3 year warranty on pole and structure. 50-lb base recommended (sold separately). Mirage 9 ft. Octagonal Market Umbrella with Auto-Tilt in Champagne Olefin is rated 3.2 out of 5 by 9. Rated 5 out of 5 by Bear from Excellent product. Excellent product. Rated 5 out of 5 by Andy from Auto - Tilt Patio 9' umbrella I shopped alot ,but kept coming back to Home Depot umbrellas. Much better prices, values and the quality was just as good as others stores ex (.Macy's, Art Van etc.) Nice color , and I need the Auto Tilt !! Also very fast delivery to my home. It said 7 days and came in 3........thanks!! Rated 1 out of 5 by Danno from Don't waste your money Set it up on my patio but didn't open or use if for a few months during the winter. When I finally opened it up in the Springtime it looked great and provided good shade. A month later came a breezy day and the top of the pole came undone exposing a spring and the cord. I was told the repair would cost more than I had paid for the umbrella! Absolute junk!! Rated 1 out of 5 by summertime from what a waste of money Put it up at noon and by 5pm it had broken!!!!!!!! Rated 5 out of 5 by Colorado from Reliable The umbrella was easy to assemble and worked exactly as advertised. Rated 2 out of 5 by SideYardX2 from Poor Quality The material was fine, but the quality of the mechanisms was very poor and light weight. The crank is made of plastic and the rib collar had a difficult time sliding up to the top. The tilt mechanism wobbled in the wind. I returned it. Rated 1 out of 5 by Toby from No good I purchased the umbrella based on the price and specifications (UV, Olefin material, etc.). Assembly was easy but the qualify is VERY poor. The material is not as thick as I thought. The joint for the tilt feature broke after three days (I received the umbrella on Wednesday and it broke on Friday). I didn't even get to try the tilt feature. I'm glad I kept the packing material because this umbrella is going back. Very disappointing. Rated 5 out of 5 by Roe66 from Looks wonderful! The color was exactly what I ordered. I'm able to enjoy the back yard because it's now so much cooler!